OpenMenu is about standardizing the structure to a restaurant’s menu so making the distinction between sizes and options is important. This ensures that our solutions can render the menus properly and our distribution partners are getting the correct information. 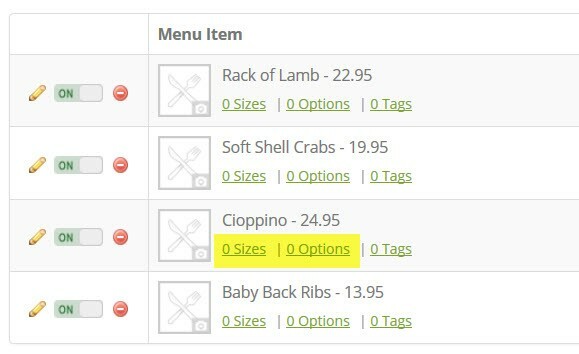 Sizes are the alternate sizes, or quantities, a menu item can be ordered. Examples of this are small, large, 16oz, 24oz, 12 per order. For menu items where there are two sizes it’s best to leave the price on the menu item blank and use the ‘sizes‘ to define the size and price. note: When adding a Menu item using the Quick Add Dialog (see below) 3 sizes can be entered. This ability is for sizes only as options must be added using the ‘options’ link as highlighted above. Options are things that can be added to a menu item as an option. The best example of this are toppings for a pizza or salad dressings for a salad. 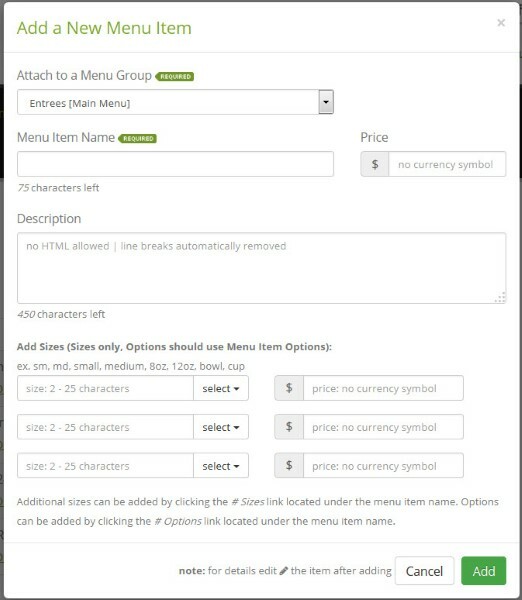 This let’s you define options which can be added to a menu item. So, if you have a sandwich and can add cheese or onions you would define each of these as options under a single option group (see below). 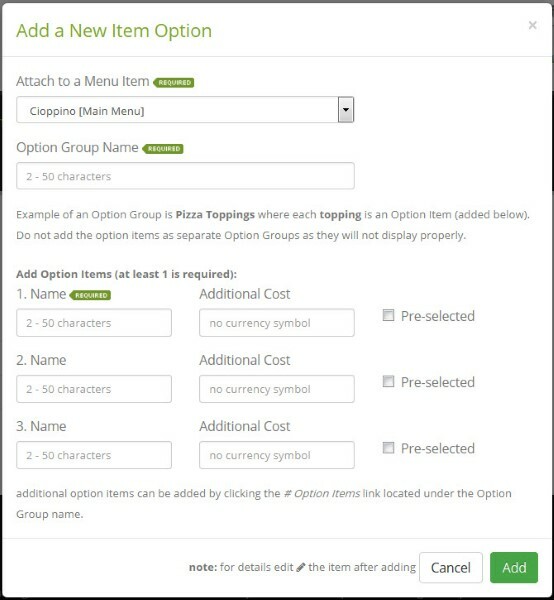 note: Options which can be applied to each menu item in a menu group it would be best to use Menu Group Options instead of Menu Item Options. This defines the options to each item without having to enter them multiple times.